​heli-hiking to city walking tours, and large groups to honeymooners, just Thrive! At Thrive Adventures, we believe there’s a spirit of exploration and wonder in everyone. Alan MacDonald has always been wild-hearted and enterprising with an independent mind. From the skate park he engineered in his parents’ yard as a young man - to the electric guitar he wielded on military deployment to Iraq - to the creation of Thrive Adventures – his is an innovative approach. He sees life as his canvas, and his innate joy and soulful desire to contribute to the world makes him beloved by family, friends, and travelers alike. Professionally, Al believes in shaping the adventure to the traveler, in experiencing locales authentically, and in revering the beauty and diversity of the globe. He is open-minded, fun-loving, thoroughly experienced, and always rigorously prepared so his travelers are free to savor the experience, not be mired in logistical detail. His passion lies in the people he guides, and he believes that pursuing an active lifestyle and exploring new horizons inevitably enhances vitality and fulfillment. He will continue to guide for a lifetime in order to repeat his most treasured moments: witnessing the awe of new adventurers as they encounter the wonder and power of this Earth. Personally, Al is a devoted father, husband, and friend. He is an avid adventure sportsman, outdoorsman, and consumer of all things documentary and podcast. Al earned his Recreation and Adventure Tourism degree from Winona State University on the banks of the Mississippi River. He has been guiding internationally for more than a decade and launched Thrive Adventures upon returning home from his tour of duty in Iraq in 2010. He served for ten years in the Minnesota National Guard. Recently retired after 26 years of public service as a probation officer, Raven is comfortable managing challenging conditions including 5 foot waves on Lake Superior in her kayak or getting just the right cream to coffee ratio in her morning cup of java. She is a 15-year National Ski Patrol veteran. She is a certified yoga and group fitness instructor. She has been teaching group fitness classes since the age of 18. In addition to living her life to the fullest, Raven has been guiding small group trips as a volunteer and is excited to bring her skills to Thrive Adventures. She considers herself a fun-monger so plan to have some serious fun on any trip she is guiding. She loves to make your travel experience unique and interesting. We could give you some examples but that would spoil the awe and wonder of the unexpected! Col. Leonard Kloeber Jr, author of VICTORY PRINCIPLES: Leadership Lessons from D-Day, graduated from the US Military Academy at West Point and the US Army General Staff Officer Course. With an MBA, a law degree, and extensive hands-on experience as a leader in both the military and business arenas, he uses his skills to help people and organizations maximize their potential and performance. Throughout his 31 years experience in command and staff positions in small and large military organizations, he was a mentor and coach to fellow servicemembers and colleagues. He now writes, speaks, and consults with individuals and organizations on leadership and performance optimization, and is a renowned expert on the history of D-Day and World War II. His Staff Rides focus on historical events and principles that, once, learned, will propel participants forward in their lives and careers today. Valentin has a passion for sharing the culture, history and beauty of Machu Picchu and the Sacred Valley. 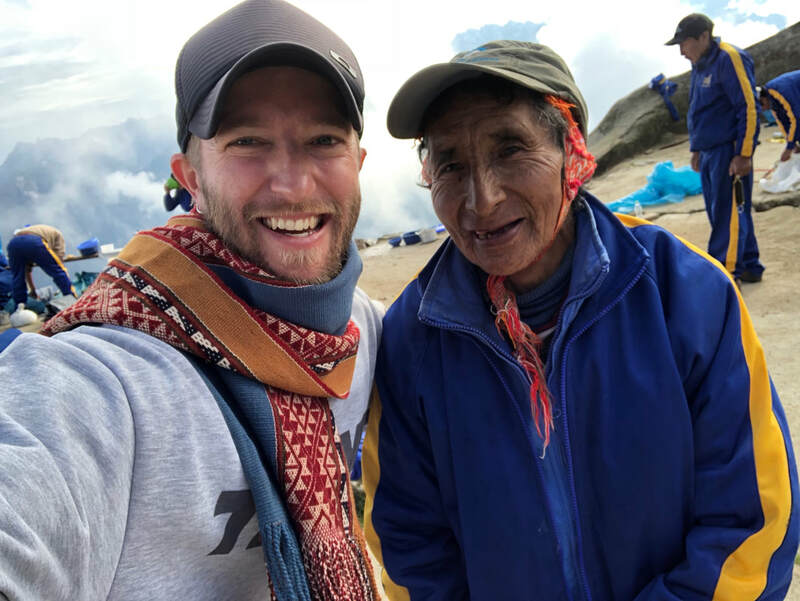 Fluent in Quechua, Spanish, and English and with decades of experience on the Inca Trail, Valentin launched his own company in 2017 and now partners with Thrive Adventures to bring travelers around the globe the most authentic, enriching experiences available in the region - complete with homestay options. A porter on the Inca Trail at age 16, Valentin learned his work ethic from his mother, who raised 8 children on a farm in the Sacred Valley. Having never attended school herself, she was committed to giving her children access to education and worked extremely hard to support her family - tending her farm and selling and bartering corn, guinea pigs, peaches and eggs. Every year, until all 8 children had finished school, she sold one of two bulls to raise money for books and uniforms, traded the other for 2 young bulls, and toiled all year raising the bulls to be ready to repeat the process. As a young person, Valentin worked as a chef on the trail while simultaneously attending the University of San Antonio in Cusco - studying for a four year degree to become a certified guide and completing coursework in tourism, history, archaeology, flora, fauna, medicine, psychology, and English. Valentin is forever grateful for his mother’s hard work, and because of his childhood, he is strongly committed to supporting children and families in the mountain villages of the Sacred Valley through social projects and work with locally owned farms and businesses. Thrive Adventures plans to bring groups to sustainably support these efforts, knowing anyone who engages here will return home with powerful, life-changing experiences and perspective. ​A native Australian, Gary is the founder and owner of adventure travel company - Right Path Adventures. He's been traveling and exploring the world for over 50 years. "I left Australia with a daypack, my passport and a one-way ticket to Kathmandu, Nepal. Thirty six years later, I say 'I am still on that same trip'." I spent the next few years trekking and climbing in Nepal and started working as a trekking guide for an international travel company. I have been running my own adventure travel trips since 1982 when I started a trekking and guiding company Alpine Ascents in Kathmandu, Nepal at the age of 25. Over the last 36 years I have led over 1,000 guests on over 250 adventure travel trips all over the world, including 40 treks and expeditions in Nepal and over 120 tours to the Dolomites in Italy, Croatia, Slovenia. I have a perfect safety record with no accidents, so you are in expert hands. I love to have fun and believe in keeping the adventure in adventure travel. I am passionate about helping my guests “get in the moment” as soon as possible on my trips. I have been told I have a knack for helping people push themselves beyond what they ever thought they could do or achieve. I am an expert at assessing people’s walking ability and matching them with the right trail. I will be able to challenge you as much or as little as you want. I am also an expert at advanced walking techniques and will gladly show you ways to improve how you walk so you are more efficient and will not feel as tired at the end of the day. I have spent many years in Europe and I know where to take people according to their fitness levels, and perhaps more importantly – where not to take people to avoid the crowds and in Croatia the heat. I have been told I have an easy going, Australian “no-worries-mate” attitude and am flexible to my guests needs and desires. In 2003 I wrote a book titled “Summit Strategies – Secrets to Mastering the Everest in Your Life”, weaving in lessons I learned while climbing and exploring my way around the world and have authored rock climbing and triathlon guidebooks. I am very passionate about showing my guests the hidden delights of the areas we visit particularly the spectacular Dolomites - the world’s best walking area - where I spend three months every summer. He's spent many years in the landscapes of . With an easy going, infectious, Australian “no-worries-mate” attitude he's a great person to explore our world with. "I am very passionate about showing my friends and guests the hidden delights of the areas we visit, particularly the Dolomites and I know this is where I want to spend the rest of my life." Dan is an internationally renowned nutrition and fitness expert who has consulted with thousands of executives worldwide to improve personal health and longevity, reduce healthcare costs, and achieve greater workplace productivity. Dan’s engaging, interactive style inspires clients to realize permanent, life-changing results, and he is recognized across multiple mediums as a leader in the field. “The Plant Based Guru” as a New York Times Bestselling book titled Dan, is an entrepreneur, speaker, 30 year veteran of the martial arts, former Guinness World Endurance Record holder for the 48 hour treadmill marathon, ultra-runner, scuba diver, and father of two amazing boys. He is a Certified Nutrition Coach with the International Board of Nutrition & Fitness Coaching and holds Masters degrees in Business Administration, Strategic Leadership, and Project Management. Dan’s education transcends nutrition, allowing him to identify with the challenges faced by today’s busy executives. He now partners with Thrive Adventures to combine his health and wellness strategies with one of a kind on-location experiences for groups seeking personal or leadership development. A fellow Veteran who deployed to Iraq with Al, Tank brings a practical knowledge of business operations earned by owning a successful touring band for 7 years - and doing most things the hard way. He has a passion for wilderness exploration and currently resides in Alaska, welcoming Thrive travelers to The Last Frontier - even if it's just for the halibut.